Gillian Bouras named it. 'Despair is surely a great temptation in today's extremely troubled world,' she wrote recently. She quotes the 416 BC Thucydides: 'the strong do what they can, and the weak suffer what they must'. Last Friday 29 April, I spoke with one of those suffering people facing her own stark reality. She is not an asylum seeker, but she was thinking about them in the midst of her own great sadness. "In a repeat of the one of the Kimba owners' comments some months back, Chapman seems to be ill-informed regarding what will actually be deposited on the property." On Friday Frydenberg managed to have it both ways, in what seems to be a now fashionable way to go about such announcements. 'There is no final decision.' And yet, there is only one site remaining from what was a 'self selection' offer by the original 28 property owners and the shortlisted six. Frydenberg described the selection process to date as 'rigorous'. However, as the follow up process will now include 'technological, safety and environmental assessment', an obvious question remains about just how 'rigorous' it could really have been. In a repeat of the one of the Kimba owners' comments some months back, Chapman seems to be quite ill-informed regarding what will actually be deposited on the property, quoting the usual presenting argument used in the former SA campaign of 1998-2004: that the dump will be for medical low-level waste from various hospitals and universities around the country. No mention as usual that there is no need for this to be stored long term in the first place. No mention of the intermediate level radioactive spent fuel rods which arrived back from France in December, and are presently housed at Lucas Heights. One wonders when such news will be broken to the property owners and the Hawker community. In contrast, the Adnyamathanha neighbours and other Traditional Owners are completely aware of this and decry the flawed, seemingly unscientific process where one person can offer their land with absolutely no consultation to the neighbours. Their own Indigenous Protected Area expert research and eyewitness knowledge cites that as well as being a site replete with 'countless thousands of Aboriginal artifacts and registered cultural heritage sites', 'There are frequent yarta ngurra-ngurrandha (earthquakes and tremors). We see the ground move and the hills move; we feel the land move. At least half a dozen times each year. In stark contrast to the previous national dump campaign of 1998-2004 which was opposed by the state government, it seems that this time no member of the SA government has come to the defence of the extraordinary Flinders Ranges, a focal point for the tourism industry of South Australia. Wilpena is a famous tourist site of great beauty and heritage, popular with both national and international tourists. Indeed the SA community next Friday will hear the royal commission's final recommendation to import high-level radioactive waste into our seemingly politically disposable state — disposable, now, even to our own politicians. As Bouras concludes, despair is a temptation but there is also 'the distressing matter of indifference. Indifference can be lethal.' And what pain it gives to those like Enice Marsh who care. But still there is resilience, and still there is hope. 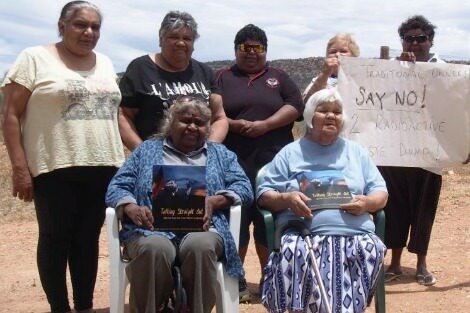 Not only are the Adnyamathanha determined to fight on, the five other communities that are now off the shortlist have pledged their solidarity in a continuing fight against 'this flawed process'. Who knows the power of such leadership to break the bonds of our own indifference and despair. Despair?? What of Hope? Is not Despair human and Hope, divine? Time we start listening to the expert advice of the First Peoples of this area; the Adnyamathanha. Time to respect their deep knowledge and time to start caring more deeply and learning from them. I agree the level of 'indifference' can be lethal . Bravo continue the fight others will be with you. On another note there seems indeed very serious concerns of instability of this area and did you say this was part owned by Senator. P L E A S E! Well said, Michele.It would be so easy to fall into despair as we learn of what appears to be the culpable ignorance of our lawmakers regarding the importance and even the very nature of the land they are so intent on destroying by turning it into a nuclear waste dump. Without you who would speak out when no-one in either State or Federal politics remains silent.? Thank you Michele for your very informative and heartfelt plea. Let us hope that more of us will stand with our Aboriginal brothers and sisters. thank you Michele. Please get on the radio with Peter Goers and tell some truth to ABC Radio 891 listeners who have been sadly mis-informed by Ian Henschke and his nuclear advocate mates. Thanks Michele. You seem to be the only source of real information about this. Once again, Michele Madigan has nailed it - clarifying this issue, especially for all us white Australians who are asleep while ill-informed governments try to put it over indigenous people. This article is a wake up call!! Well at this time there is only human to advocate for us in this shocking situation. No wonder there is despair. Thank you Michele for working so hard to save our State. Well done, Michele in keeping the issue before many. Madigan RSJ’s sound diplomacy alongside the Adynamathanha Elders, ‘five other communities … off the shortlist’ pulsing words with familiar negotiable value and meaning. Frydenberg, Chapman … ‘our own politicians’ plod familiar phonemes unattached to either: or sources or resources: not civilly, given not cogently. And convenient to whom? ‘For ye have the poor always with you; but me ye have not always.’ Poverty’s increasingly fewer options. ‘Always’ not ‘eternally’ whilst ‘Blessed are the poor in spirit.’ Further, ‘Noli me tangerer.’ I take to mean: Do not delude yourself: You’re Self! Certainly ‘… helplessness’ when skilled adults inform: ’Ye hafta to cut ye umbilical cord!’. Well, no! E.g. You’re dead. There’s a spade! Bury yourself! Some services are, necessarily, duteous and on honour, performed for our fellow human being. While making cogent argument ‘helplessness’ is always not an option. Taking an honourable, sacred leap with Enice, Japan and Germany, Australian Indigenous and non-Indigenous Citizens – Sorry Peoples – and an NGO Shinkansen Railway system. Reference e.g. The Snowy River Scheme, solar power, water from agricultural crops, tiny houses, … mass refuge immigration with desert knowhow resources of humans galore. Why, the PM is NOW fast-forwarding visas for some international trading: billions of tourists!